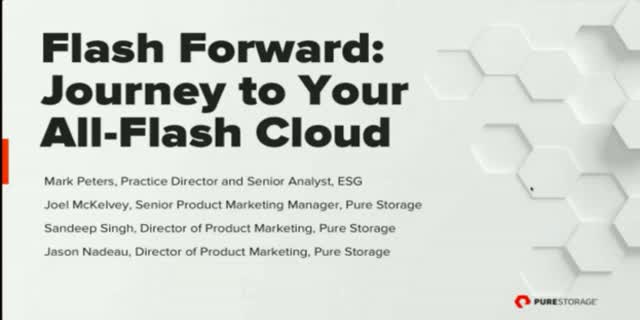 Join Mark Peters, Enterprise Strategy Group Senior Analyst, as he moderates a discussion on the three stages to achieve an all-flash cloud storage platform. According to research and trends for 2017, most IT departments prioritize “cloud” as their top IT initiative. Cloud models for IT are increasingly viewed as critical to agile and high performance infrastructure. The cloud economic model is viewed as critical to meeting demanding IT challenges with limited budgets. An all-flash hybrid cloud storage platform can support the goal of becoming more cloud-like, including automated, orchestrated, self-service offerings while allowing you to maintain control of your data and infrastructure.